Authored by abalaji on May 4 2018, 7:24 AM. 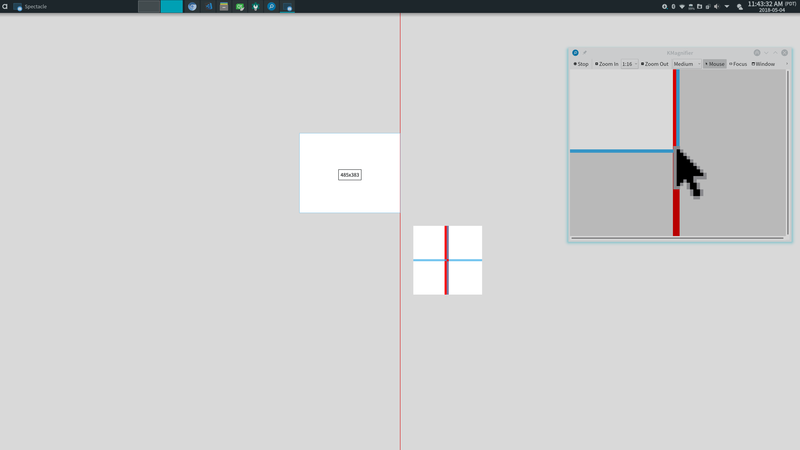 abalaji mentioned this in D12626: Port QML Rectangle cropper to QWidget + QPainter. I already linked to https://chris.beams.io/posts/git-commit/#imperative multiple times, but here is how I'd word it: "Add back magnifier to QPainter port of rectangle selection"
I'd also reference the commit here where it was originally implemented, i.e. 790cb3fb2a97. Please change this. You may also have to Edit Related Revisions (box on the top right) due to not specifying this during arc diff time. Could not test in detail yet, but in general behaves okay. Visually, it's missing the border and the top part of the crosshair is off to the left a bit. If by "logic" you meant the code, I did not look at that yet. abalaji added a dependency: D12626: Port QML Rectangle cropper to QWidget + QPainter. abalaji retitled this revision from Implement magnifier for Rectangle mode port to Add back magnifier to QPainter port of rectangle selection. One nip-tick: inline should be placed in function definition not in declaration, you can make other review to correct it. No, it does not make sense: What you are describing is a function call which was inlined by the compiler. However, that's for the compiler to decide, as mentioned before. inline won't at all prevent them from being called again, making your "documentation purposes" very questionable. If you have as simple helper function, put it in an anonymous namespace outside of the class. If you have to access member variables, use a private function. So, is it best to just ditch inline from everywhere and let the compiler decide? Yup, that's what I understood from the SO link. Rectangle is now 1 "real" pixel wide even on HiDPI. Tested on 2x scaling on 3840x2160. Red line is 2 real pixels wide. Ah, sorry. I believe there was some miscommunication: I meant for 1x scaling, the line should be aligned to the grid, and thus render as a 1px line. However, for HiDPI scaling, Qt should still scale up the line width for you, of course. The problem was merely that you positioned the line in-between two pixels, so it got rendered as two lines. For example for 2x scaling, the line should be 2px wide etc. Oh no, don't disable it. You just have to make sure to align correctly on the pixel grid. If you disable antialiasing, it will look bad for fractional scaling (e.g. 1.7x). If you look closely at the left border, you'll see the border is rendered with two different colours. If I'm not mistaken, this means that the border is still not aligned to the pixel grid, so Qt uses antialiasing to make it appear as if it was rendered at the in-between position. I'd expect a solid (single colour) 2px line for 2x scaling, a 1px line for 1x scaling, and an antialiased in-between line for 1.5x scaling. Is the bottom and right border of the magnifier working for you with 1x scaling? Just asking, because with QML it never worked for me, but for QPainter it should probably work? The borders of the size label and the bottom help text are still fuzzy. 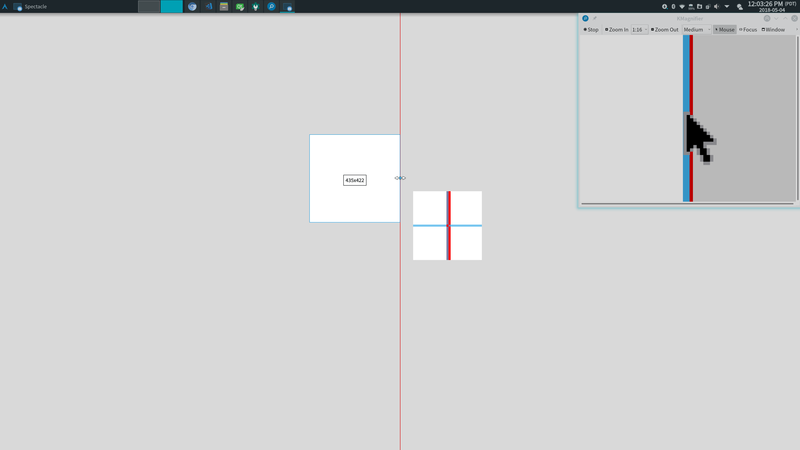 Rn the border rendering for the magnifier is quite naive, so I suspect that 1x scaling would break it. Please read http://doc.qt.io/qt-5/qrectf.html#rendering for more information on what's happening on line 499 and how it "works" with 2x scaling. On 2x, only half of 1 logical pixel (2 real pixels) of the border ends up showing up, the other half is overlapped by the PixmapFragment from line 500. The fix is to not use drawRect but use fillRect with x, y, height, width adjusted by 1 pixel outwards. Just moved unrelated changes to back to the main diff, so that's sorted out. Thanks, I'll do more testing later, and in case no issues are found I'll start with the code review. However, will probably not get done this weekend, busy with other things. FWIW, since the magnifier feature has landed in the current QML-based version, I think it would be appropriate to fold this change back into D12626 now.